Cobra uses the latest technology, military grade components and the best design practices in the world to pack this phenomenal performance into a sleek detector nearly half the size of other detectors in the market. Super-fast sweep circuitry provides extra detection range and the best possible advance warning to all radar/laser guns currently used and Canada, including POP Mode (Super-fast) Instant-on Radar guns. Color OLED Display provides clear indication of the signal being detected as well as current mode of the detector. 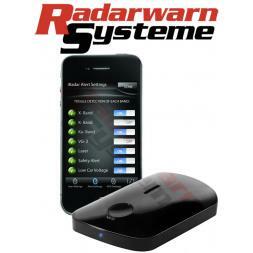 Cobra radar laser detectors also pairs with your Apple iPhone/Android smartphones via Bluetooth to provide location-based alerts using Cobra's proprietary national database for AURA Speed/Red-light Camera, Known Speed Traps and Dangerous Intersections. Drive with the ultimate detector and drive with peace-of-mind.